Maximum of 12.5 kg per person for luggage mule - in soft bags only! No riding experience is necessary. The huts and horses are hired from the Basotho people in remote areas. The village huts are very basic and are equipped with a gas cooker, cooking & eating utensils, mattresses on the floor, and a bucket of water. On trek you experience "THE REAL AFRICA", staying in Basotho villages. The trails traverse spectacular mountain passes and some of Lesotho's highest waterfalls. Basotho Guides and a packhorse accompany the treks. 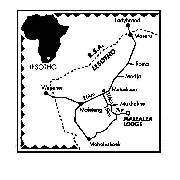 Price includes: Return transfer Maseru; All meals while at lodge; Accomodation at lodge and also fee for village hits on Pony trek; Ponies with luggage mule and guide for trek; Guide for day hikes. Price excludes: Pony trek food for 3 1/2 days, visas (if required), travel insurance, health requirements, gratuities, all items of a personal nature and any service not specified. Maximum Weight of riders. 90 kg. Tours are flexible and can be tailor-made to your requirements. Pony Trekking 1 packhorse per 4 -5 pax. 12.5 kg luggage per person including food. TIP - We recommend approximately R30 per day per group. There is a Sangoma - Herbalist in the village. This is for people who are genuinely interested in finding out about Traditional Healers. The Bones are thrown and the Sangoma discusses health, travel and well-being of the visitor. Day 1:We pick you up at Maseru the capital of Lesotho. Your destination is the Malealea Lodge at around 6,5O0 ft in the aptly named Valley of Paradise. A local Children's Basotho choir & a local band using home made instruments can be arranged for your entertainment on request. (Clients to tip children.) Malealea Lodge. Day 2:A hike to a nearby gorge that boasts Bushman Paintings done by the San nearly 500 years ago, and to the nearby Botsoela waterfall. (Or Pony Trek - extra) Accommodation - Malealea Lodge. Day 3:A 6 - 7 hour horse trek to the small village of Ribaneng. An hours climb up to the beautiful waterfall behind the village. Village Huts. Day 5:A 6 -7 hour trek to stay in a small Basotho village, Ha Sekoting, which is surrounded by a ring of mountains. Village Huts. Day 6:You descend into the Valley of Paradise, where you are welcomed with hot showers and the comforts of Malealea Lodge. Day 7:A hike through The Pitseng Canyon where a cascade of three rock pools has been carved out over the centuries. Malealea Lodge. Your up now for the down! Typical village hut, your home for the night.